It seems every travel book about Ireland loves the 120-mile long Ring of Kerry and no organized tour would ever miss it on their itinerary. With so much hype, I assumed it would be spectacular. I assumed wrong! 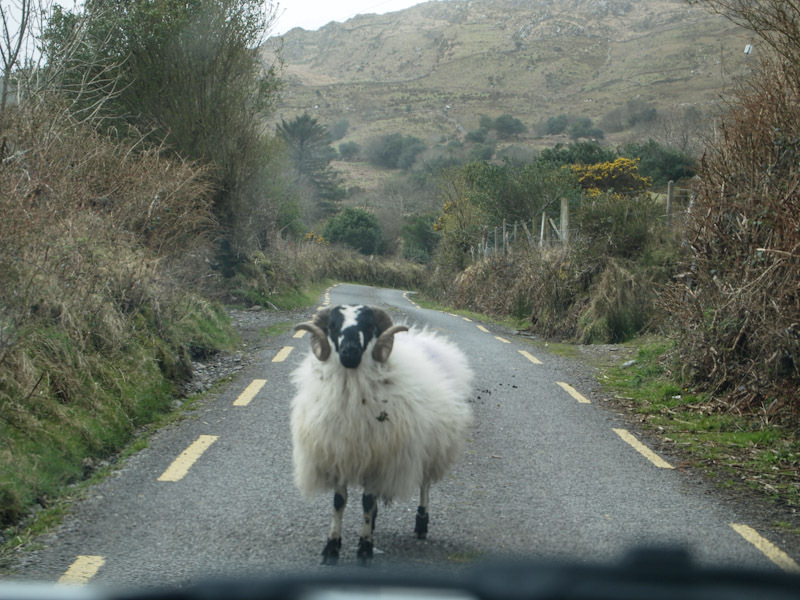 Driving the famous Ring of Kerry was rather boring, and in my opinion, overrated. The weather had been volatile the last few days and it looked sunny when we woke up. 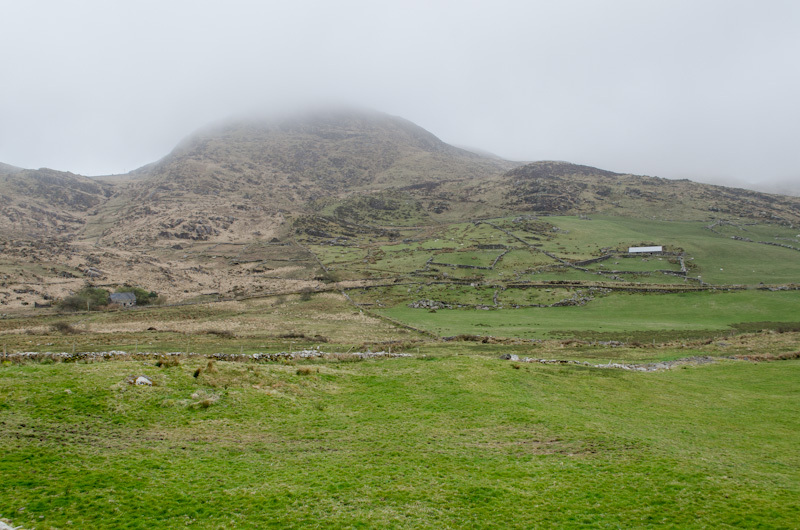 The weather forecast had said the weather should be nice, so we decided to drive the Ring of Kerry. We left our rental house near Bantry expecting to spend an exciting day driving the Ring. 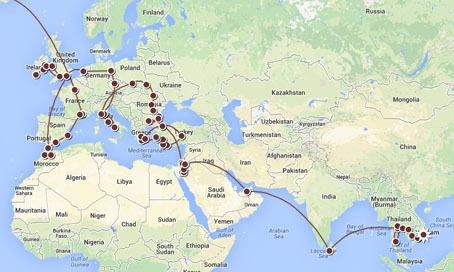 Our Rick Steves travel guide on Ireland suggested we travel in a clockwise route, which went against our road atlas recommending a counter-clockwise direction. Since we were following the guidebook we decided to go in a clockwise direction and start in the town of Kenmare. The road from Bantry to Kenmare is narrow with a lot of tight curves, which would have been a lot of fun if we had had a performance car. Unfortunately, our tiny Nissan Micra rental car had a mushy suspension and the car rolled around each corner so I kept our speed within reason, which still created screams of terror from the wife and daughter. As we entered the picturesque town of Kenmare we turned left and started our tour of the Ring of Kerry. As we drove I asked my wife Kerri, “Is this is?” It looked just like anywhere else on the western coast of Ireland and I was confused as to why people flock here like moths to a flame. Kerri, having toured the Ring of Kerry 15 years earlier with her grandmother, assured me that this was it. In fact, Kerri even commented that it didn’t look as amazing as she had remembered. 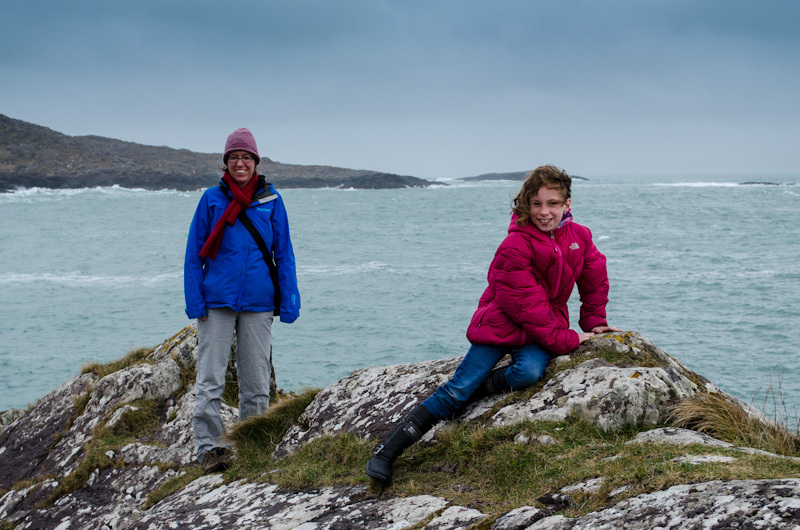 We had been in western Ireland for 10 days already and had done a lot of exploring on the Sheeps Head peninsula and found the Ring of Kerry to be of similar terrain. 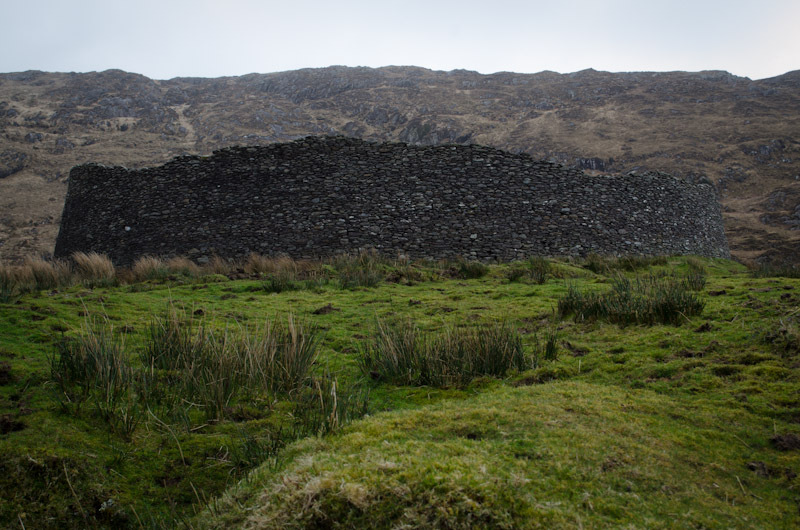 The landscape is very barren and rocky with a narrow 2-lane road (N70) running through it. We were excited when we finally came to the small town of Sneem and decided that we should stop for a cup of coffee before falling asleep from the dullness of the drive. 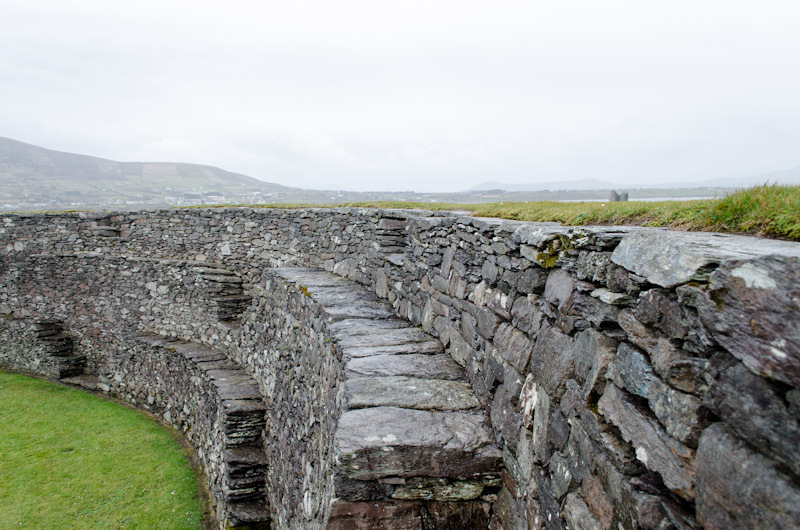 Once back on the road we decided that we would stop at the Staigue fort just 3 miles west of Sneem. I had imagined some kind of military fort, but was surprised to find a stone ring fort that was built around 300-400 A.D. and was actually fun to visit. On the way back down to the N70 we had a couple of problems with stubborn sheep not wanting to get out of the road, but after a few honks of the horn we had them running down the road much to the delight of my daughter. Back on the highway we soon came to Carrol’s Cove, a nice sandy beach with a trailer park and Ireland’s only “Beachside Bar.” We thought it looked like the perfect place to enjoy our packed lunch and walk on the beach. After Carrol’s Cove we began heading uphill towards Coomakesta Pass. 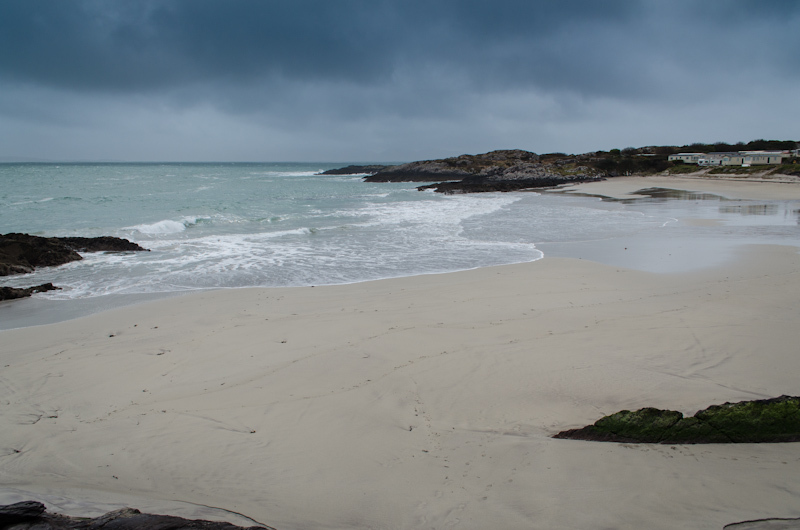 The weather had turned to rain and wind and our nice day did not look so nice anymore. 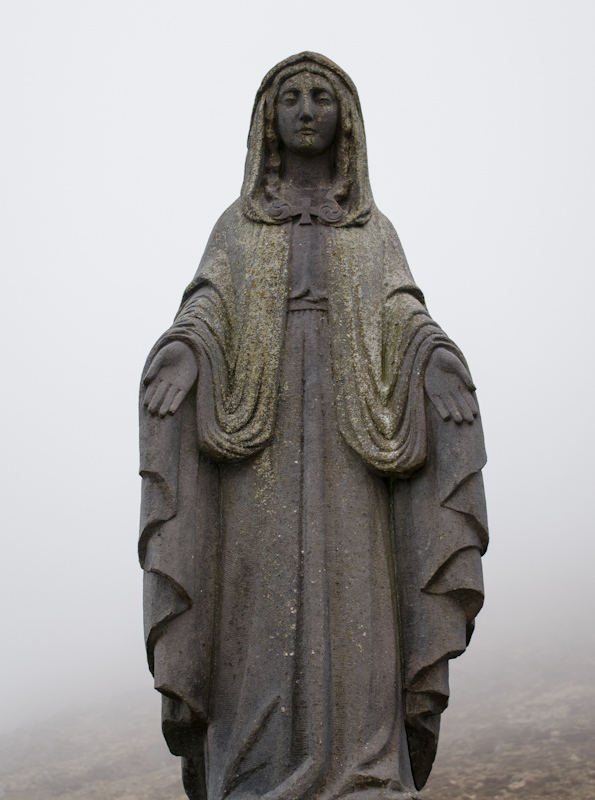 Once at the pass we pulled onto a turnoff with a statue and a couple of guys huddling with some sheep. We tried to get out of the car, but found the wind so strong we could barely open the doors. After some hard work we got them open and tried to get a couple of photos before being blown off the pass. We continued along the Ring of Kerry in the rain and wind for many more miles and finally came to something we knew we would enjoy, more ring forts! Towards the end of the drive, or beginning if you go counter-clockwise, are two more ring forts, Cahergal and Leacanabuaile. These two forts sit side by side in the middle of sheep pasture and would have been a pleasant walk if we did not have the strong wind and rain. We drudged through the bad weather and had fun trying to not get blown off the top of the ring fort walls. After visiting the last two ring forts we decided to go check out a castle ruin that looked like something out of a Dracula movie. Not seeing any signs saying to keep out, we climbed under a barbwire fence and made our way across a field to check it out. Once at the castle we went inside and found it to be full of cows. Yes, COWS! 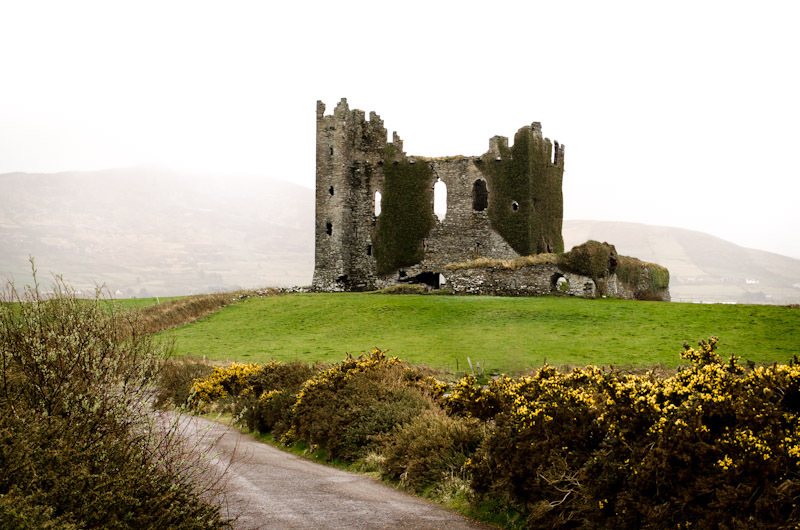 We now refer to it as “Cow Castle.” Its actual name is Ballycarbery Castle and was built in the 16th century. It would have been a lot of fun to explore more if the weather had not been so awful and the castle ruin had not been full of cows. The last city on the Ring of Kerry was Killarney, which would be the first city if you go in a counter-clockwise direction. Killarney is a super touristy town with horse drawn carriages and tour buses everywhere! 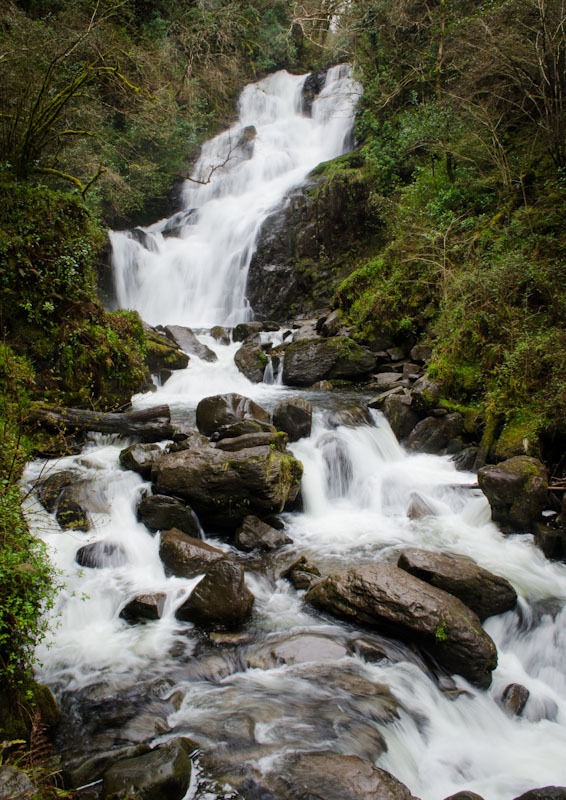 It also has some great attractions including Ross Castle, Torc Waterfall, Muckross House, and several others. Since the weather was so bad and it was late in the day we headed straight home, but came back to Killarney two more times to visit the attractions there. Personally, I thought the Ring of Kerry is very overhyped. It is a lot of driving on narrow roads with scenery that looks like everywhere else in western Ireland. Unfortunately, being the driver meant I had to keep my eyes on the road and probably missed a lot of the views and stuff that makes it so famous. 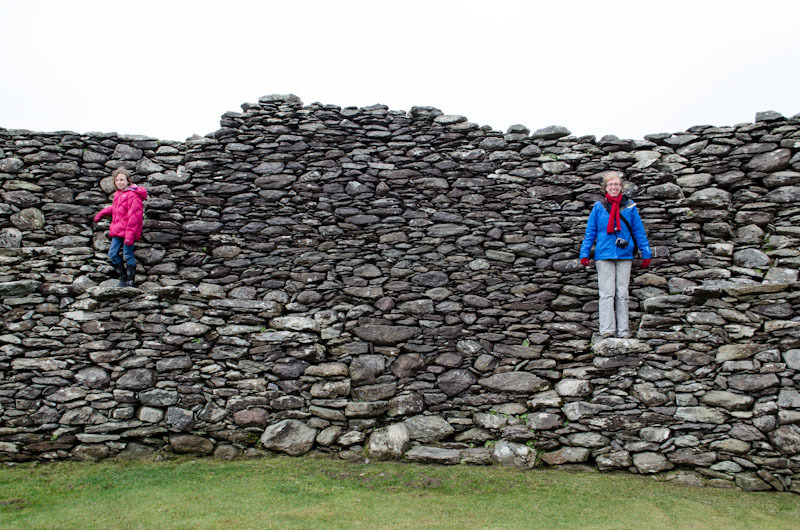 We thought the best parts of the loop were the ring forts and the attractions in Killarney. 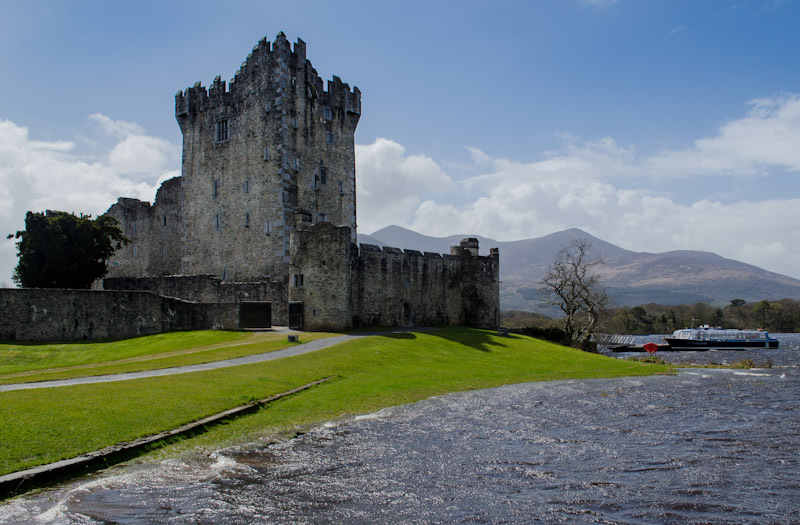 If you are limited on time, heading to the two ring forts closest to Killarney and then spending the rest of your time in Killarney is the best bet and you won’t be missing much by not doing the rest of the loop. 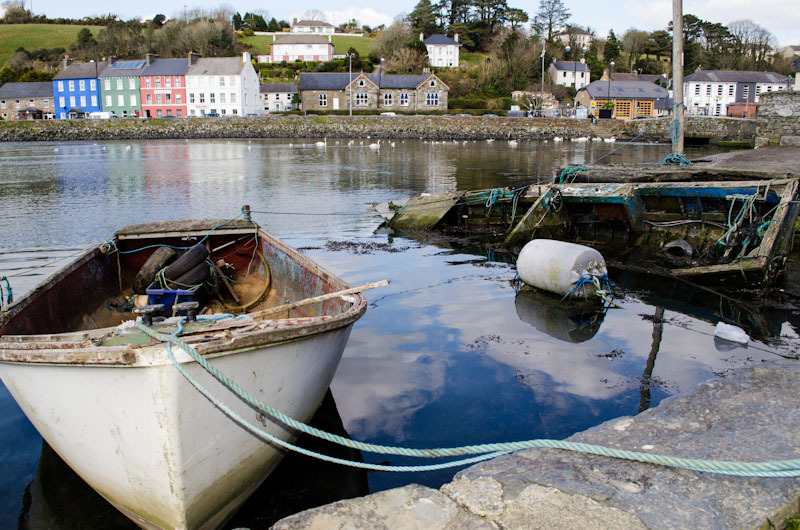 For the month of April, our around the world travels brought us to the beautiful town of Bantry. The town of Bantry is located in Southwest Ireland along the Atlantic Ocean. I would have to say that Bantry is one of my favorite places we have been so far, as it reminds me a lot of home in Oregon; the weather, the greenery and the beautiful landscape. Being in Bantry felt a little like returning home and it helped ease some of my homesickness. I could have easily spent more time there. We stayed in a lovely house just outside of Bantry on a working farm and waking up each day to the peaceful countryside, hearing the birds chirping, and watching the cows graze in the pasture helped rejuvenate my soul. During our month stay, we had a wonderful time exploring Bantry and had the opportunity to meet some genuinely nice and friendly people. As always, saying goodbye was tinged with sadness and I am hoping that someday our travels will bring us back to Bantry. Since I really enjoyed Bantry, I thought I might share some of my favorite things to do in and around Bantry. One of the activities that seems to always help ground me and ease my worries is hiking. Luckily for me, my husband Jason and daughter Sydney are always up for a good hike. 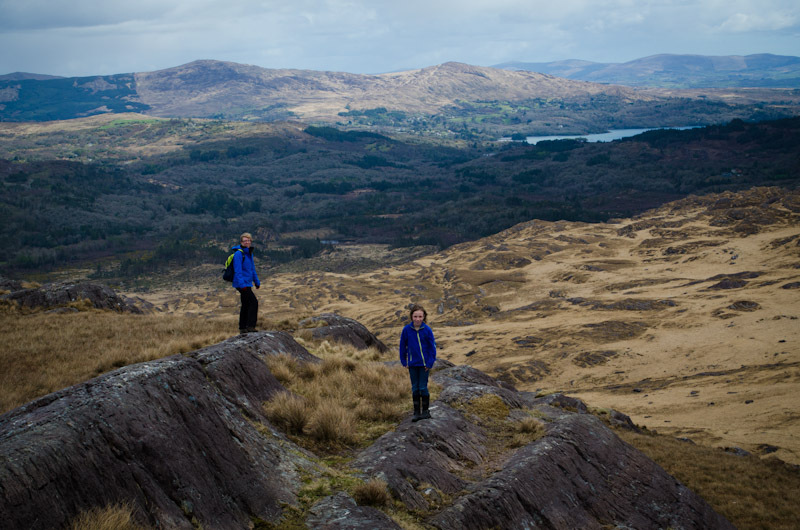 So, when I saw the number of hikes available in and around Bantry, I was elated. We spent a lot of our time hiking, but unfortunately we only were able to hike a small fraction of the trails available in the area. 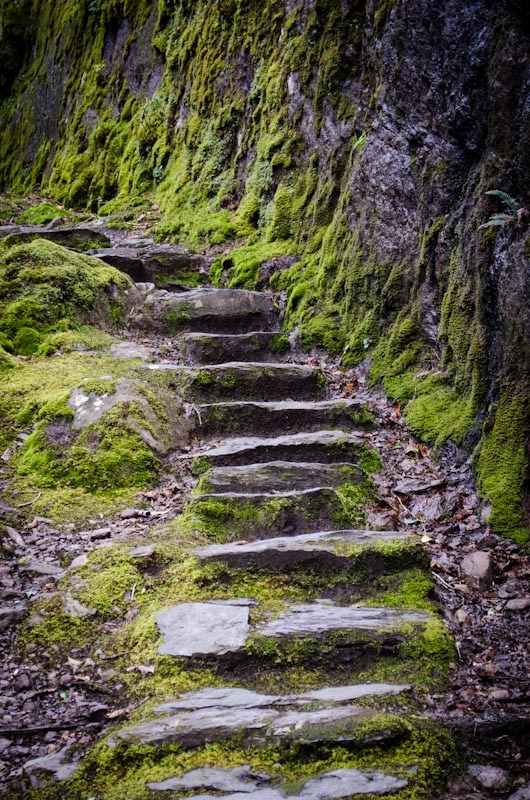 Here are some of our favorite hikes that we took. 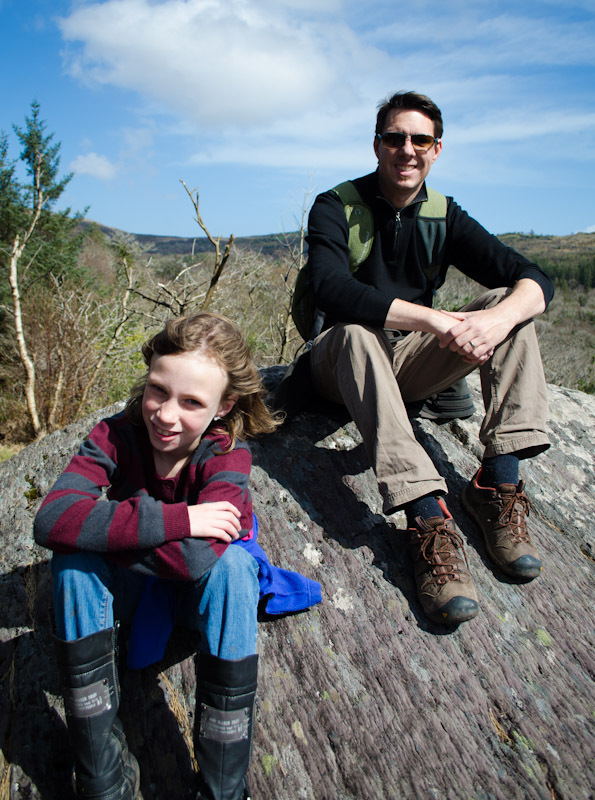 Glengarriff Nature Reserve is a 15 minute drive from Bantry and was one of Jason and Sydney’s favorite places to get out and hike. There are trails for all fitness levels and desired lengths with some phenomenal views of Bantry Bay. 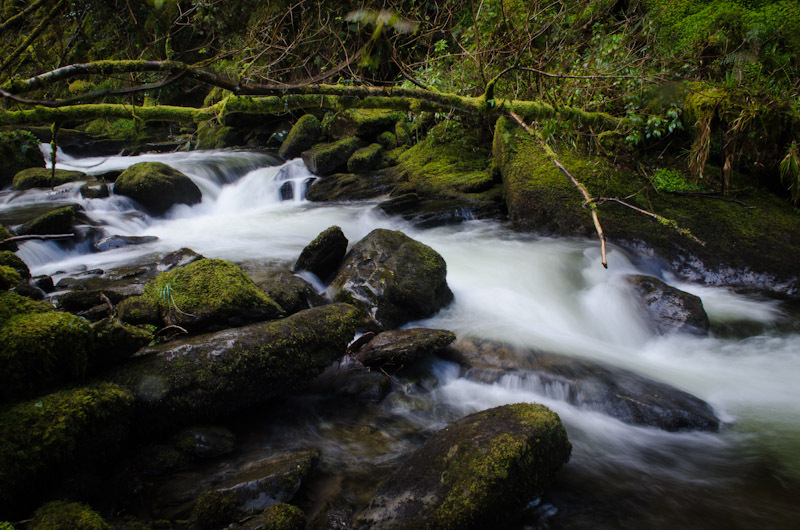 Unlike a lot of Ireland, Glengarriff is still forested and has a lovely stream that burbles through it. Bring a picnic and enjoy a stroll through nature. 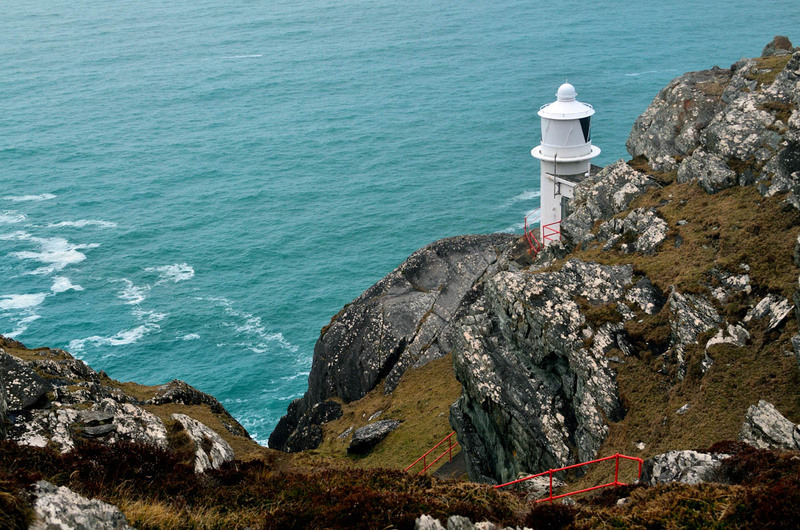 The drive out to Sheep’s Head Lighthouse is an adventure in itself on a curvy, and at points sphincter-pinching road, but offers some breathtaking views of the bays and the countryside of Ireland. The day we choose to hike started out bright and sunny, however the fog rapidly moved in. The hike meandered through some bogs with sheep placidly grazing along the path. As we walked we could hear the ocean crashing below. The scenery, with the added fog, made me feel like I was in the novel “Wuthering Heights,” remote and mysterious. 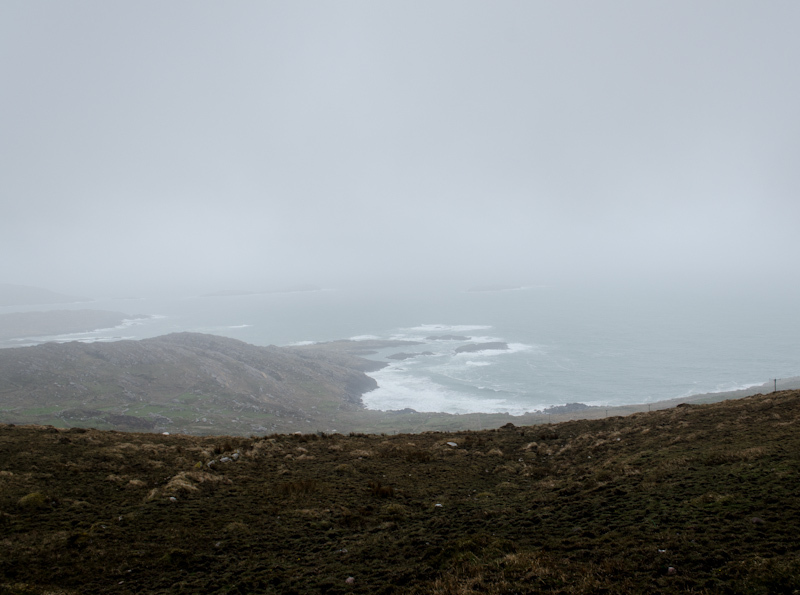 By the time we made it to the lighthouse the fog and cleared giving us a wonderful view of the Atlantic and ships sailing in and out of Bantry Bay. 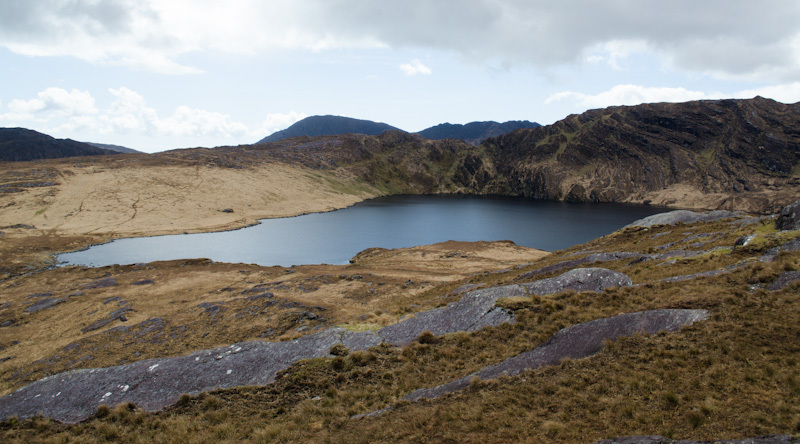 The day we were returning from the Ring of Kerry I noticed a steep, curvy road leading up to a glaciated lake. When I saw the lake I knew I just had to make it up there, as it looked so remote and wild. A couple days later I convinced Jason to go exploring to see if we could find that road. After successfully navigating the steep, curvy, narrow road with several hairpin turns, we made it to the trailhead for Barley Lake. The trailhead rapidly disappeared into boggy ground and we were faced with making our own trail to the lake. After taking in the views, which are some of the best of Bantry bay around, Jason decided that he did not want to risk getting his shoes muddy, or losing one in the thick bog. Sydney, however, was willing to blaze a trail with me. It was fun trying to navigate the boggy ground. However, towards the end I became overconfident watching Sydney hop from one bunch of grass to the next and I blithely followed her ending up sinking up to my ankles in the muck. It was a really squishy walk back to the car! Sydney loves riding horses and had been taking horse riding lessons for over a year before leaving on our around the world adventure. 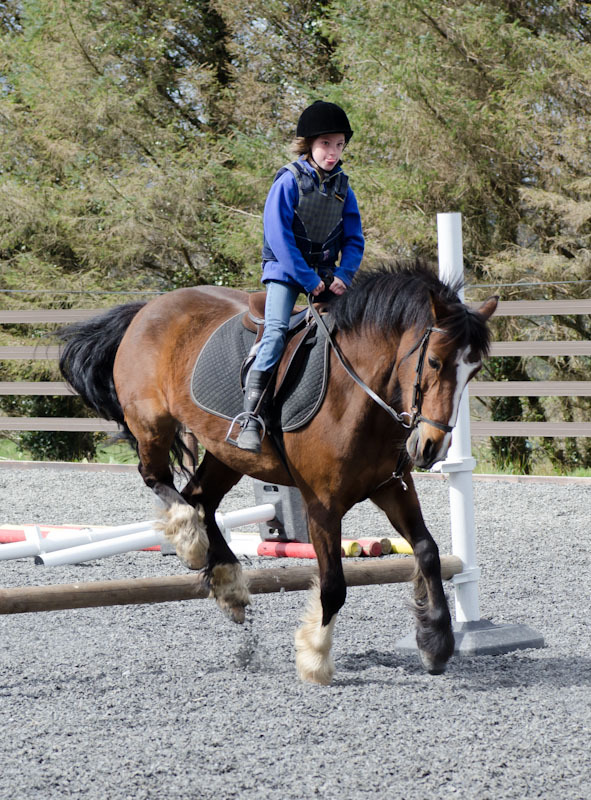 We had promised Sydney that when we got to Ireland we would find some horse riding lessons again. Fortunately for us, we did. The horse riding lessons were just across from where we were staying and as it turned out a wonderful opportunity for Sydney. The owner of this pony trekking, Georgia Sheils, (087-7765539) has a beautiful property of pastures and forested area with lots of trails meandering through it. 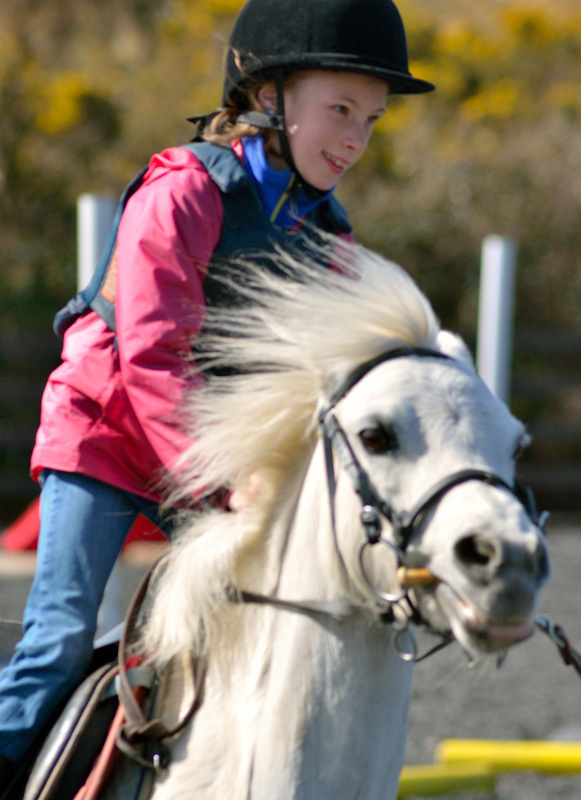 Georgia offers trail riding, jumping and basic lessons. I cannot stress enough how amazing Georgia is. She is an excellent teacher and was so patient with Sydney. When Sydney learned that Georgia offered jumping she set a goal of learning how to jump before leaving Ireland. Georgia was able to work with Sydney and by the end of her stay was able to jump. I loved seeing the joy and confidence on Sydney’s face and am so glad that we found Georgia. Ireland has lots of the stone circles dotting the landscape and we visited several of these stone circles over our month stay in Ireland. 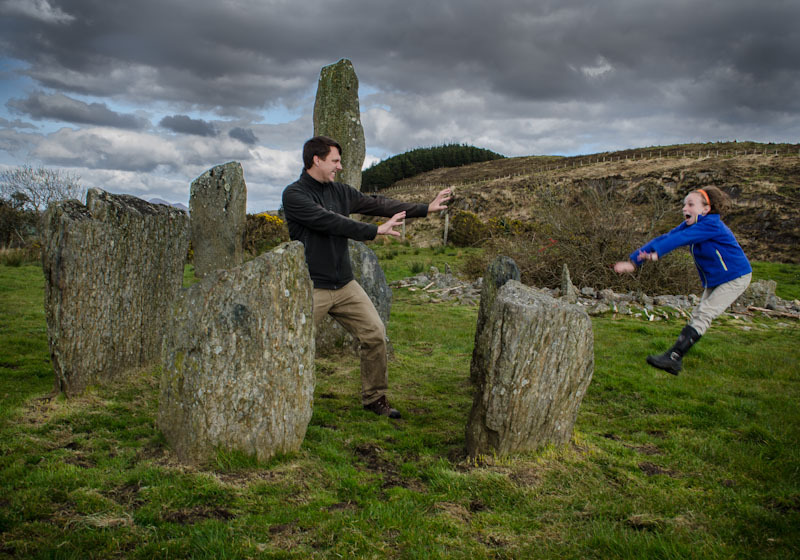 But, we had no clue there was a stone circle so near us, as we stumbled on Kealkil stone circle by accident. 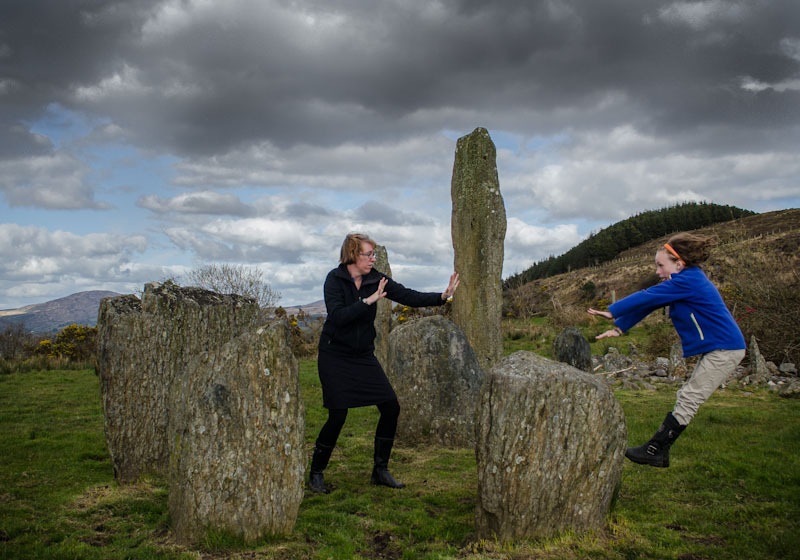 As we were driving one day, we noticed a sign for the stone circle and decided to make a detour. Boy am I glad that we did as it is one of the most interesting stone circles we saw while in Ireland. 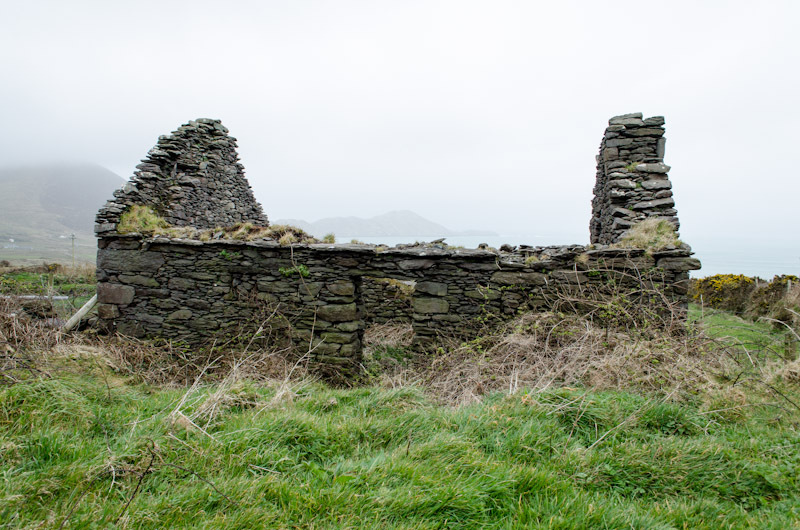 Kealkil is located in a boggy pasture on top of a hill approximately 10 minutes outside Bantry. The circle overlooks Bantry Bay and offers some wonderful views of the surrounding area. 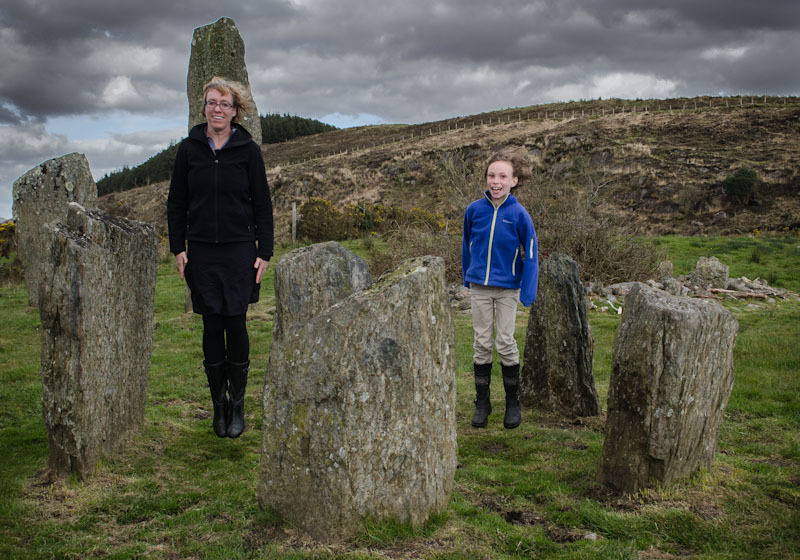 The stone circle is well preserved includes two impressively tall stones. 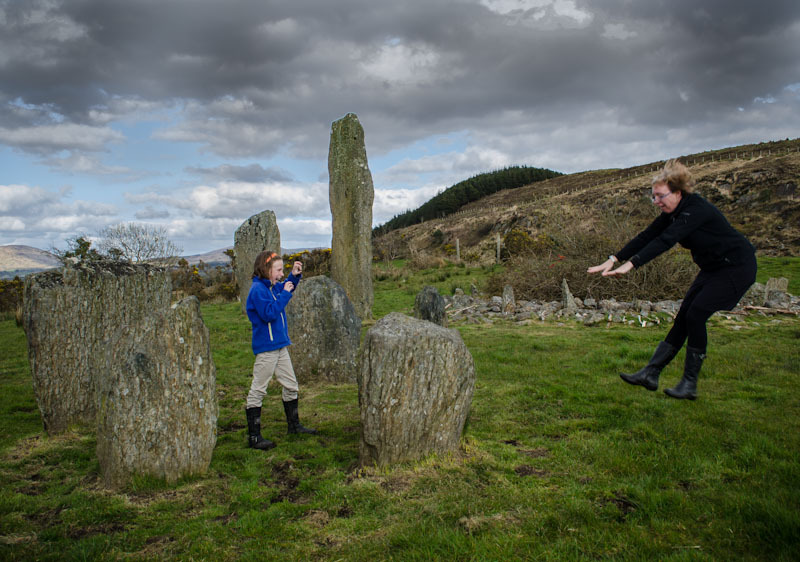 We had fun testing the “powers” of the stone circle. A word of warning, bring boots, as the walk can be muddy. We went to Bantry Library to check the posting board to see about activities in and around Bantry for Sydney. The posting board was a marvelous resource. There was everything from knitting, music lessons, Karate to babysitting. We were able to find several activities for Sydney to do while in Bantry. But most exciting, Jason went in to see about a library card and we were able to get one with no problem! Though we have a kindle there is just something about a book that makes reading so much more enjoyable – the smell, the touch, the memories. We were also able to check out several movies and enjoyed having a movie marathon, which is something we had not done in a long time. 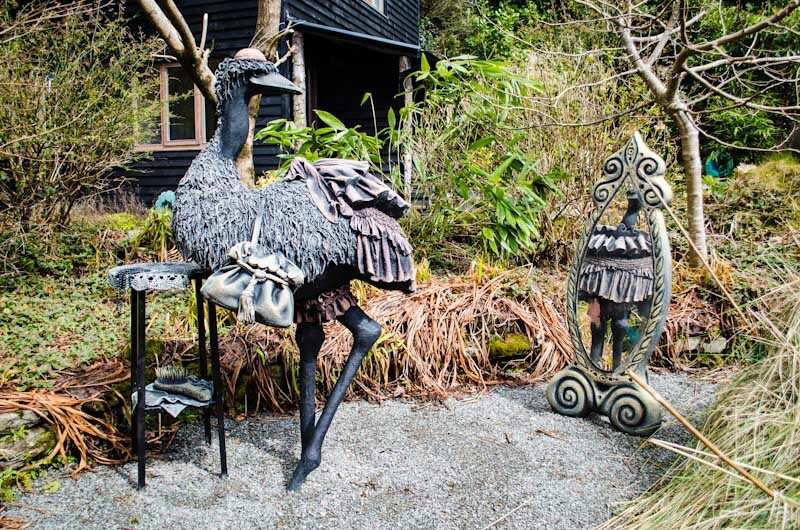 The Ewe Sculpture Garden is approximately 20 minutes outside of Bantry and is is not just another garden. An enjoyable afternoon can easily be spent here. 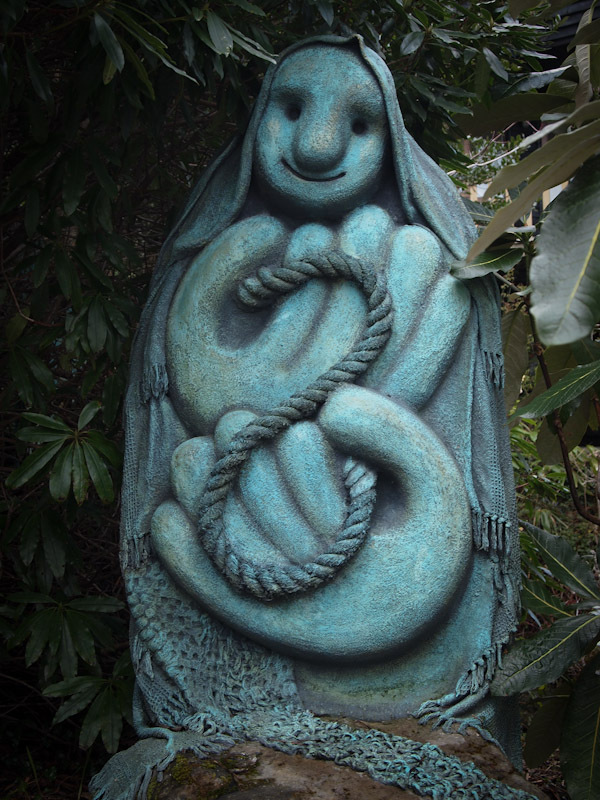 The Ewe sculpture garden is an interactive garden with lots of fun whimsical sculptures and tons of games for everyone to play and other activities to do. There is a stream that meanders through the garden. 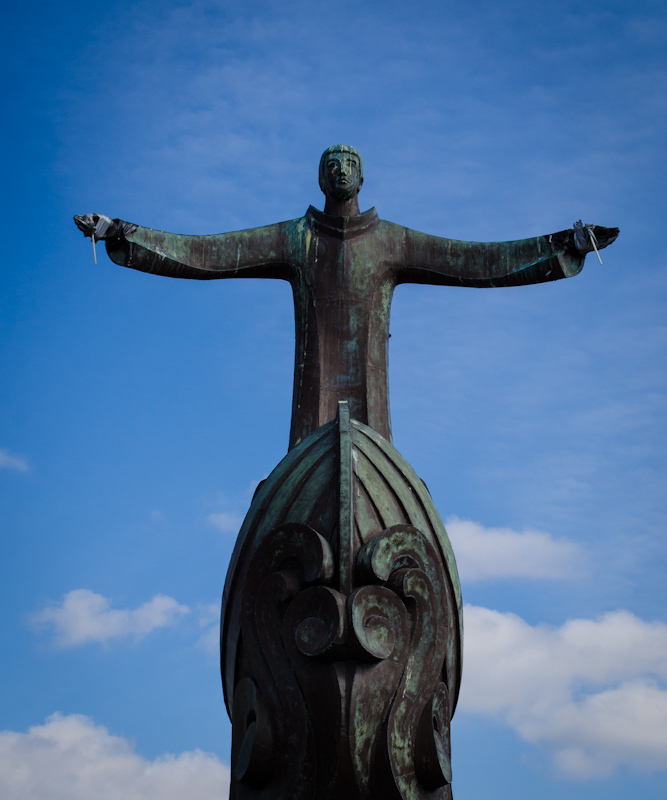 Bring a lunch and enjoy playing games, making nature sculptures and admire the sculptures. For a photo tour check out my other post on the Ewe Experience. Every Friday in downtown Bantry you can find a Farmer’s Market. The market is a mixture of fresh produce, artisan foods, farm animals, and a boot sale. A boot sale, for those who live in the US, is like a flea market. I found some wonderful cheeses and Sydney was excited to see a horse for sale. She schemed throughout the day on how we could care for the horse while we traveled. This scheme included having her Grandma and Grandpa in New Mexico keep the horse in their backyard until we returned from our around the world trip. I am sure Grandma and Grandpa will be relieved to know we firmly said no to that one. I am a little hesitant to mention this activity, as Garnish Island would only be good on a sunny day and with the expectation that it costs a lot to get out to the island. 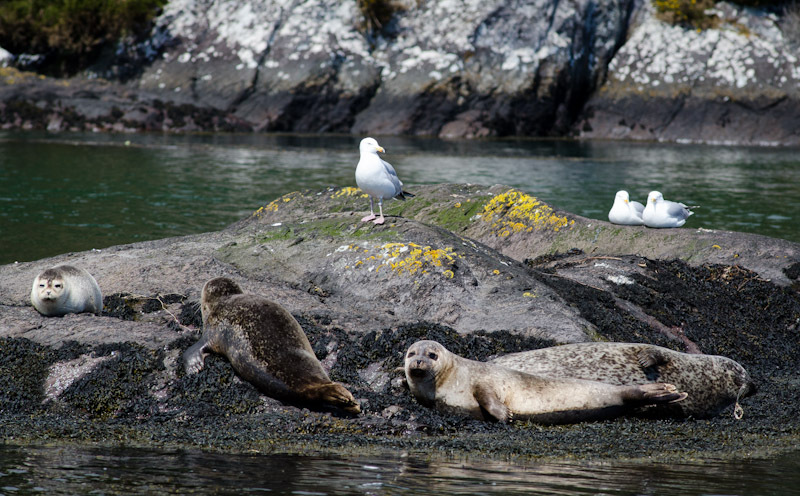 Garnish Island is located in Glengarriff Harbor and is about a 10-minute boat ride from the town of Glengariff. Garnish Island has been turned into a huge garden and also contains the ruins of a watchtower. 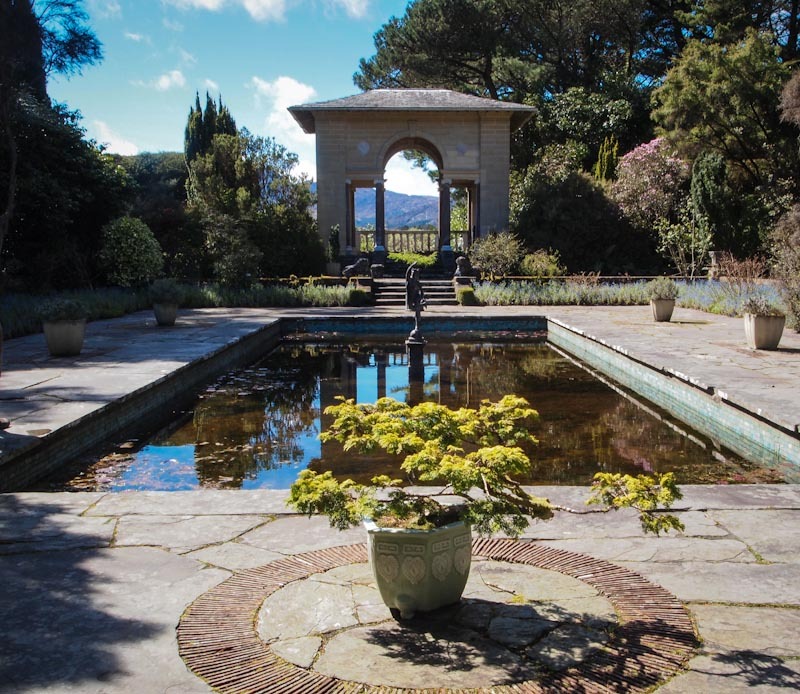 The garden consists of both natural and manicured areas including an “Italian Garden” and a “Walled Garden”. We picked the perfect day for Garnish Island. The sun was out and we enjoyed wandering through the gardens soaking up the sun and exploring the ruins of the watchtower. Sydney especially liked the boat ride, as we passed several seals sunbathing on the rocks. So, if you are thinking about adding Ireland to your travels, I would highly recommend staying in Bantry, Ireland. You will not be disappointed. If you are looking for a place to stay near Bantry I highly recommend Michael and Bredda Cronin’s Ninorc House. We stayed there for nearly a month and really enjoyed our time there. BTW, this is not a sponsored link, I just really loved staying in their house and think you would too.